My good buddy, Joanne (aka JoJot) challenged our CCEE Stampers group to make a project using silhouettes as our main focus this week. I kept my project very simple. I black embossed Flight of the Butterfly images, sponged my background with Ranger Tattered Rose and Peeled Paint Distress inks, and then stamped Vintage Vogue images on the background. I also sponged the same two colors on a background piece of cardstock since I didn't have any designer paper that I thought went well with what I created. I can't believe another week has gone!!! Help! This is so pretty with the matching sponged layers and the black (& polka-dotted) butterflies). That one punched circle in the top - or is it part of a butterfly wing - is the perfect touch. Who needs designer paper when it looks this good without it. Love the butterfly silhouettes and the flowers. I like how you sponged with the different colors to give it this pattern. Beautiful stamping on this card, and I love the sentiment. I love your M&M's banner too! Delicious! This is just sooo beautiful, Charlene! I just love the soft colors with the bold butterflies! Absolutely gorgeous miss Bert!! I adore your butterflies!! 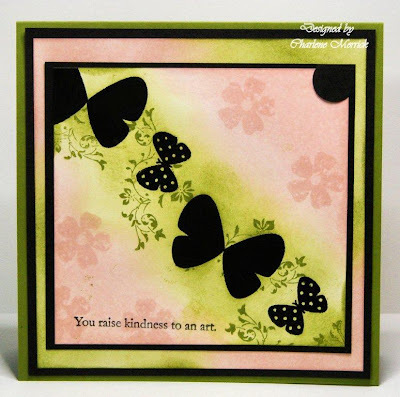 And the bg you created with the distress inks is simply FABULOUS!!! How creative and striking!! WOW! Beautiful!!! Love the colors! I left a little something for you on my blog post this morning! Thanks for always being so sweet and inspiring!! Get Well on Tax Day! Pink Cow - April Fool?? ?